Novo tópico para se falar das noticias e novidades do Xbox Live. O Xbox Live Gold dá-te jogos grátis todos os meses, a acção multijogador mais avançada de sempre, descontos exclusivos para membros até 75% em jogos na Loja Xbox e muito mais. Na Xbox One, tudo é melhor com emparelhamento mais inteligente e rápido, e acção multijogador online para quem estiver em tua casa. Joga jogos como Titanfall™ e Halo com os teus amigos numa rede com mais de 300.000 servidores que oferece o desempenho máximo. O modo multijogador alojado na nuvem ajuda a eliminar os desfasamentos e os truques ilícitos. Com a Xbox One, usa o Smart Match para encontrares novos adversários que reflectem o teu nível e estilo. O Smart Match na Xbox One usa algoritmos inteligentes para te encontrar novos adversários que reflectem o teu nível e estilo. O sistema de reputação baseado na comunidade ajuda a identificar truques ilícitos e jogadores irritantes para os manter afastados dos teus jogos. Obtém jogos que sempre quiseste jogar com a biblioteca de títulos grátis para Xbox One e Xbox 360 em permanente crescimento. Vem conhecer os jogos grátis já disponíveis para membros Xbox Live Gold. Grava os teus momentos multijogador mais épicos, guarda-os facilmente na nuvem e utiliza o Upload Studio para personalizares os teus clips e partilhares com os teus amigos ou no Twitter. Também podes manter-te a par das actividades actuais dos teus amigos com a nova secção de amigos. Vê os jogos mais populares que os teus amigos estão a jogar e as Pontuações de Jogador para ver quem melhorou a pontuação nos últimos 30 dias. Look playa, you should never pay full price for an Xbox Live Gold membership, not when there's almost always a sale price to be had. Even Microsoft hawks its Xbox Live Gold subscriptions for a discount on occasion, like it's doing now -- for a limited time, you can purchase a 12-month Xbox Live Gold membership for $39.99 from the Microsoft Store. That's $20 off the regular price of $59.99 and represents the typical sale price that third-party vendors often mark these things down for. Every once in awhile you can find them for a few dollars less, and if you're lucky, you can snag one for about $30 from a reliable third-party vendor, though that type of deep discount is pretty rare. Microsoft's price, while not the lowest we've ever seen, is a decent deal, especially if you don't want to play the waiting game for it to go on sale elsewhere. You can also grab your code from Microsoft immediately if going the digital route. 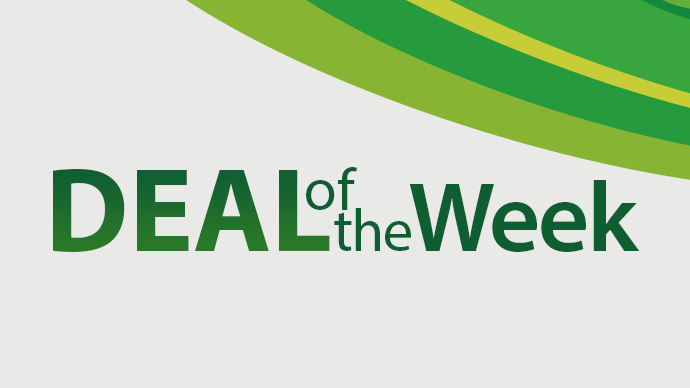 Alternately, you can opt for the physical card at the same discounted price. If you've been out of the loop for awhile, keep in mind that Xbox Live Gold is no longer required for some apps and features, such as Netflix, Twitch, ESPN, Skype, and YouTube, to name a few. However, it is needed for online gameplay and related features like party chat. 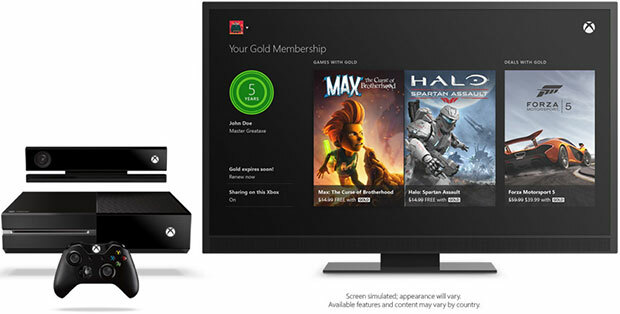 There are various other benefits that come with an Xbox Live Gold membership, including exclusive discounts and free games. With regards to the latter, Xbox Live Gold members who own an Xbox One can download Rayman Legends for free during the month of March. If you own an Xbox 360, a Gold membership gets you Tomb Raider (available to download March 1-15) and Bioshock Infinite (through March 31). Microsoft hasn't indicated how long the sale will be good for. If interested, go here. Xbox Gold members will be getting three new free games to play in this March edition. Xbox One players will be getting Rayman Legends, while Xbox 360 players will be getting Tomb Raider and BioShock Infinite. Xbox is giving you more of what you love, with twice the free Games in April! Next month, you can look forward to four free games on Xbox 360, and two free games on Xbox One. The network outages of Christmas are over, but that doesn't mean gamers don't feel any unease about it happening again. During my chat today with Microsoft head Phil Spencer, I asked what Microsoft is doing to address these concerns. "Our commitment to Xbox One customers is to make sure our service is robust and reliable," Spencer says. While there wasn't any security threats in the holiday DDoS attacks, Spencer says it's just as important to Microsoft as having a stable service. Spencer also shared that he's been having conversations with other companies, like Sony and Nintendo, about this very topic. He says working and learning together can only benefit everyone. "I don't think it's great when PSN goes down," Spencer says. "It doesn't help me. All it does is put the fear and distrust from any gamer that's out there, so I look at all of us together as this is our collective opportunity to share what we can about what we're learning and how things are growing. Those conversations happen, which I think is great." He said the holiday attacks have been a learning experience and he appreciates Xbox Live fans' patience during that time. A Deputy from the Jackson County Sheriff’s Office has been fired after being caught on camera making racial threats over Xbox Live. Former Deputy Michael Slater abused a man known only as “David”, who was deliberately trolling Slater, while the two were facing off playing Call of Duty: Advanced Warfare. An argument between the two men escalated, to the point where Slater shouted, “You about to come to a f*****g paid police officer’s house. I get paid to beat up n*****s like you.” Slater then, to prove his credentials as a police officer, gave “David” his badge number. Smart. 2K games are enjoying their 10th anniversary this week, and to celebrate they offer some of their latest games on sale. On Xbox One, Evolve gets a 20% discount, WWe 2K15 Wrestlemania Bundle is at half price, while Xbox 360 users can buy each XCOM game for$9.99 or the first Borderlands for $4.99. During the announcement Microsoft also revealed that more than 100 million games have been downloaded over the course of the promotion and 5 billion GamerScore has been earned. 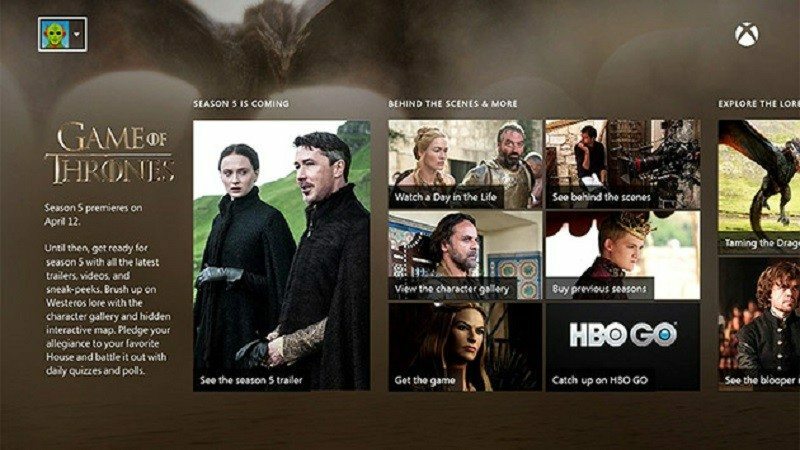 If you haven’t already gorged yourself on the four leaked episodes already, or don’t have access to HBO, Microsoft is offering Xbox Live members – on both Xbox One and Xbox 360 – the chance to watch the first episode of Game of Thrones’ season 5 for free. The season 5 premiere of Game of Thrones aired last night on HBO, as well as showing internationally on new streaming service HBO Now, but its pre-debut momentum was broken by the leak of the first four episodes of season 5, with each episode reportedly being downloaded over one million times each, confirming Game of Thrones’ existing position as the most downloaded show in history. HBO’s fantasy television show, based on the A Song of Fire and Ice novels by George R.R. Martin, has been a smash hit for the cable channel since it hit screens back in 2011, popular with both the audience – the show has a gross of 14.4 million viewers per episode – and the critics. The offer is only available for free via Xbox Live to US customers, mainly due to foreign syndication agreements, though this change after the episode airs in the UK tonight on Sky Atlantic. US Xbox Live members have until 16th April to watch the episode for free. Microsoft has announced the Xbox Live Games with Gold for May 2015. Two Xbox One games and two Xbox 360 games will be free to download. Larry Hryb ou “ Major Nelson” da Xbox live volta a atacar, no bom sentido neste caso. Este postou que a Xbox iria lançar uma semana denominada “ ULTIMATE SALE” que começou dia 7 até ao fim desta semana, dia 13. Irá conter cerca de 70 títulos a uma redução de preço entre os 40% a 50%, e para os tenham status GOLD na Xbox live, terão direito a mais 10% de desconto adicional. Tudo isto, em formato digital na Xbox Store. Finalmente a Microsoft e a Xbox One ganham juízo, esperamos ainda mais melhorias com o Windows 10. Earlier sign-in and friends list issues have been resolved. Update 3: The status page still doesn't reflect the issue with playing games and apps, but the Xbox support Twitter account has sent out a message at 5:49 PM PDT stating, "Our teams are working hard to make sure you can access all of your game & app content." Update 2: As of 4:13 PM PDT, The Xbox Live status page now lists the only affected gaming and social services as unlocking achievements, suggesting the sign-in issues have (at least temporarily) been resolved. A support tweet adds, "Sign in across devices should be back to normal." However, issues with buying downloadable items has since been added to the status page's alert list, and there remain reports of those (myself included) who are unable to play certain digital games. Update: Today's issues are also impacting Xbox Live members' ability to play at least certain games, including Smite. Reports have been rolling in of various Xbox Live problems, including sign-in issues and an inability to see which of your friends are online. I've personally been running into the latter issue. The official Xbox support Twitter account has sent out a message stating, "We're working hard on the current issues signing in to Xbox Live. Thank you for your patience." 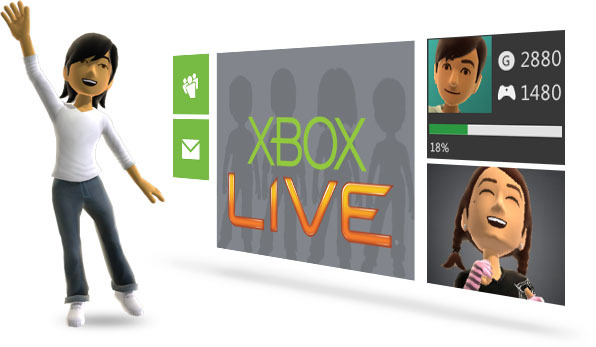 It also links to the the Xbox Live status page, which confirms there are sign-in issues on both Xbox One and Xbox 360. "Xbox members, are you having trouble connecting to Xbox Live? We are currently working with our partner to find a fix for these issues," the status page states as of 12:24 PM PDT. "Thanks for being patient. Another update will be provided as soon as possible." We'll report back with any updates. In the meantime, let us know if you're having any Xbox Live issues in the comments below. 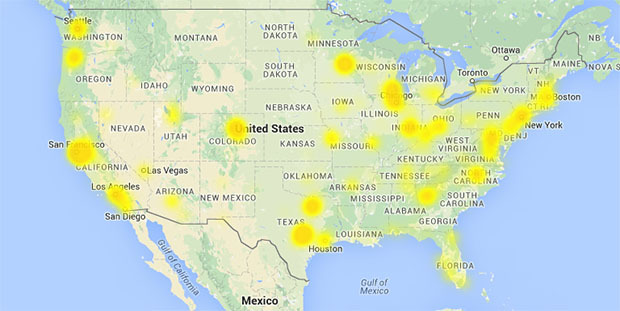 If you've been experiencing super-slow downloads on Xbox Live, don't fret: you're not alone. That's the upside; the downside is that while Microsoft is on the case, it doesn't seem to understand the rhyme or reason behind the cause. If there's a secondary upside; you can at least relish the fact that it's merely slow, and not down entirely, as has happened before. Hey, guys! We're currently tracking this, but we need a few things from you to help us out. First, give all of the steps on our Troubleshoot Slow Game or App Downloads on Xbox One page a try. If that doesn't help you out, please post back with your Region, your internet provider, and a screenshot of the advanced settings page for your network here: Settings > Network > Advanced. We'll be able to pass that information along to the appropriate people and work on getting this resolved. As Neowin reports, this slowdown could be related to issues that the Level3 content delivery network is also experiencing, as seen in the shot above. If that's the case, it could mean that not everyone is experiencing downtime, but most certainly could. Why do these things always wait for the weekend to strike? Xbox Live Indie Games are no more, with developers being given one year to finish active projects before complete closure in 2017. Microsoft has officially begun the process of shutting down its Xbox Live Indie Games programme for the Xbox 360, as it looks to push both developers and gamers to the latest-generation Xbox One. Launched in 2009 as a rebranding of the Xbox 360's Community Games portal, the Xbox Live Indie Games (XBLIG) programme offered smaller developers a shot at producing games for distribution through Xbox Live. 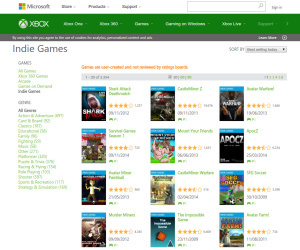 Certain restrictions were put in place: games could be no more than 150MB, raised to 500MB in 2012; pricing had to adhere to a set tiered structure; all games must provide an eight-minute trial period; and unlike games published through the Xbox Live Arcade programme, entry to which is considerably more expensive, achievements are not available. To prevent floods of shovelware, developers were also given a limit to how many titles they could have active at any given time, initially eight then raised to 20 in 2012. This is a very strange statement to make because Microsoft seems completely unwilling to release its core line-up on Windows. Additionally, Fable Legends is a free-to-play title, and the only Halo game is from a mobile spin-off. There are some exceptions such as Killer Instinct and Gears of War, but Microsoft isn’t delivering and still treating Windows gaming quite poorly. Unless Microsoft plans to release those core games on PC, I really can’t understand what world Mehdi is living in. Microsoft, what the heck are you thinking? Do you really want to make the entire PC gaming community irate and launch another form of disastrous anti-consumer DRM? PC gamers will never and I mean never pay a subscription to access your servers. The only time people are prepared to pay a monthly sub is with MMOs and the majority of those are going free-to-play anyway! This really is laughable and explains why the Xbox app exists on Windows 10. I have no idea how a company can completely mess up something so badly and then try to make the same mistake once again. It also comes across that the whole Windows gaming focus was simply to introduce an online subscription and fool PC gamers to pay for an online service.